Well done on enrolling into BUSM4471 and securing an internship! As Canvas won’t open until the start of the official flex term and you may undertake your placement before this date, we have extracted key information about the assessments and tasks you will need to undertake from Canvas and made it available to you in advance. to maximise your learning and experience while on placement. It is therefore strongly encouraged you complete the assessments while on placement. When term officially starts and Canvas opens, you can then simply submit your work you’ve already done! so you will need to do this when Canvas opens. Please ensure you complete all necessary assessment pieces on time. All the best on placement! There are no face to face classes. All learning is done in the workplace. You may receive a call or visit from an Academic mentor. All queries once you have commenced your internship should be directed to your course coordinator simon.thornton@rmit.edu.au. Detail: You are to write a report on what you did during your internship. 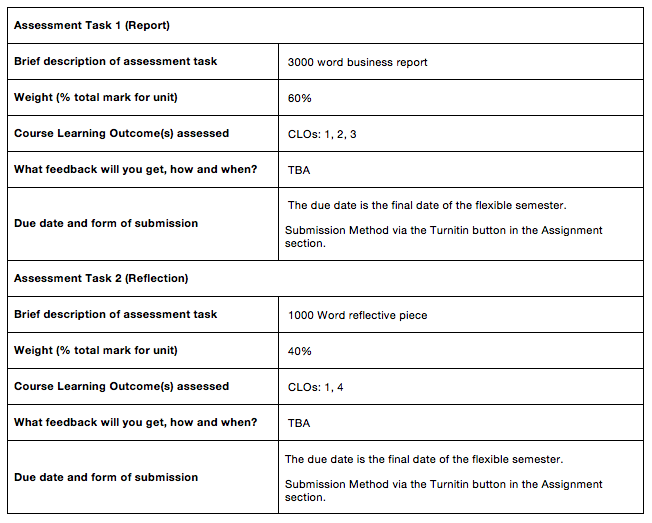 Here is the Rubric that will be used to mark your report. Please refer to it and then write any queries on the Discussion board. Feedback will be provided in Canvas and/or emailed to students. Here is the Rubric that will be used to measure your result. You are to prepare a reflective piece on the good, bad and ugly of your internship experience. Perhaps you encountered culture shock, perhaps you hated your experience and never want to do that task again, perhaps it was just what you expected and now you are certain of what you want to do. Whatever it was, this is the time to reflect and discuss your experience.